Holiday Gift Drive - Check out this photo! Shorecrest's Holiday Gift Drive gives the Shorecrest Community an opportunity to work with the Guardian ad Litem Foundation to provide for children in the foster care system. If you have purchased gifts, it is OK to start sending them in to classrooms! 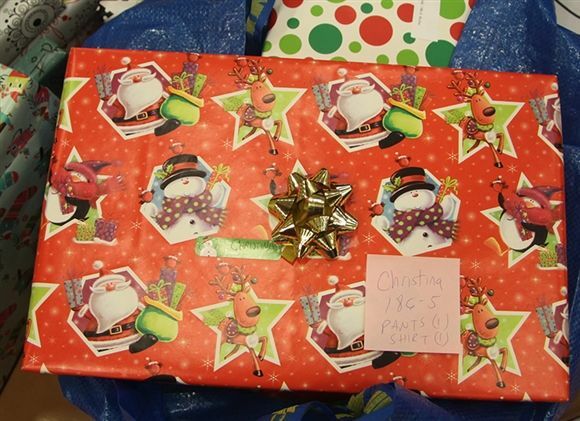 See the photo attached... the gift has a small green tag on the left that will stay with the present when it is delivered, and it also has a sticky note for the SCA volunteers to see the family number, child number, and what's inside. This will be removed before the gift is handed off. These tags save a lot of time so SCA Volunteers don't have to peek inside presents or add name tags to hundreds of gifts! You may still receive some friendly reminder from Sign Up Genius about gift purchasing. If you would like to join in the fun but don't have time to shop, you can donate funds for SCA Volunteers to shop on your behalf. They will check the lists at the last minute and fill in gaps where necessary. Donate to the Gift Drive online here. We still need Middle School parents to help on gift wrapping day (Dec. 6) for less than an hour. Email us at giftdrive@shorecrest.org if you can help. Over 2,000 children in Pinellas and Pasco Counties have been removed from their homes to live under court supervision, due to abuse or neglect. Guardian ad Litem represents these children. Their mission: To provide advocacy and support for abused, abandoned or neglected children in Pinellas and Pasco Counties. Their vision: A world where every child has a safe and permanent home, and the opportunity to thrive. Shorecrest has agreed again this year to purchase holiday gifts for 250 children in the system. We will receive a master list that we will divide by classroom or grade level. You will be invited to participate by purchasing specific items using Sign Up Genius, or by donating online so that we can purchase the items. What will the list from the children look like? The lists are very similar to the lists your children of the same age would make, with the addition of things they need like warm clothes, underwear and so on. We are getting a list of specific needs and wants; this will help us to get each child what they really need (new coat, shoes, laptop for school) and something they’d like (hot wheels, Barbie). Volunteer to be a classroom liaison. Coordinate with your class, present the list to them, and remind them to bring in gifts. Volunteer on pick up day to wrap gifts, assemble gifts, or run to the store for last minute additions. If shopping isn't your thing or you just don't have the time, we offer an online donation option and SCA Volunteers will shop on your behalf. Donate to the Gift Drive online here. Email us at giftdrive@shorecrest.org with questions or to volunteer in any way. Thank You for your continued support of this worthwhile project!